The polyester modular wall mounted enclosure range, UDP/UDPT, with a IP 65/54 protection degree, is available off the shelf in many different sizes. Either a plain door or transparent door can be ordered. Several enclosures may be combined to extend the width or depth to, for example, accommodate large components and maintain internal communication. This enclosure range is well suited for outdoor installations, even when exposed to direct sunlight. The risk for component failure, and with that unnecessary downtime, is eliminated as water and dust are prevented from entering the enclosure. Fibre-glass reinforced polyester. UDPT viewing area: polycarbonate. Modular moulded, with rear fixing. Direct fixing to the wall or by use of wall mounted brackets. To a pole by use of EPF, to the floor by use of the plinth UPP or DIN-base UAF and UMPS. In single plain door enclosures, sealing is ensured by an EPDM gasket glued against the frame. Flush mounted door, with or without window and 100° opening. For larger sizes, a door support is supplied for easier closing. In double door enclosures, sealing is ensured by an injected one piece polyurethane gasket. Premounted handle, suitable for all types of half cylinder locks (standard depth of 40 mm). Five locking points (three points in 500 mm width enclosures). -25 °C to 70 °C in continuous use (peak temperatures up to 130 °C). Self extinguishing and halogen free. Double insulated, according to EN61439-1. Rated insulation voltage Ui=1000V. Complies with IP 65 | TYPE 4, 4X, 12, 13 for single and double door enclosures / IP 54 | TYPE 4, 4X, 12, 13 for transparent door enclosures. Impact resistance IK 10 (IK 07 for enclosures with transparent door). CE, CSA, GOST and cULus_UL Listed. For further approvals, please contact Eldon's sales department. RAL 7035, precoloured raw material. Enclosure with door, fixing screws for the mounting plate and wall mounting brackets. (Lock cylinder is not included in the delivery). A flexible solution where customers can choose enclosures that meet their size requirements, off the shelf, in order to create enclosure configurations made up of smaller individual enclosures. The enclosure offers high corrosion resistance while being UV resistant. The installed components inside the enclosure will be safe and secure due to the high protection degree. Customers can receive enclosures with a short delivery time, that match their requirements. If required, enclosures can be combined to accommodate large components, while being able to maintain internal communication. 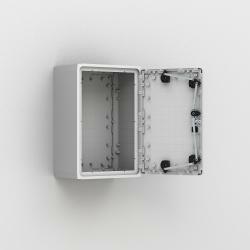 Customers can combine enclosures either to extend the configurations width or depth. The enclosure provides customers with an outdoor solution which can be exposed to direct sunlight, at a competitive price. Component failure and unnecessary downtime is avoided as water and dust are prevented from entering the enclosure.